Robert Vasey, a widower, of Wing, a small North Buckinghamshire village halfway between Aylesbury and Bletchley, married Emma Woods, Spinster, of Southcote, Linslade, an equally small Bedfordshire village near Leighton Buzzard, at Wing Parish Church, on 6 April 1885. By the time of the 1891 census, they were living at Aylesbury Road, Wing, and had two sons, Robert Jnr, aged 3, and Francis aged 6 months, both of whom had been born in the village. After leaving school Francis worked as a clerk for Messrs. Brantom & Co. coal/corn merchants of Leighton Buzzard and also served in the Bedfordshire Yeomanry for two years before emigrating to Australia, c1911. Here in the summer of 1915 he was working in the wheat belt area of Western Australia, (W.A.). Information given by his Mother after the war stated that Francis had been working as a farmer at Wickepin, W.A. 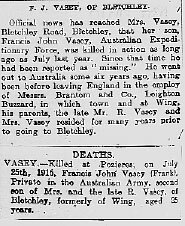 ; however, official Australian records, while confirming his occupation as a farmer, show that at the time of his enlistment he was living at 177 Presse Street, Boulder, W.A. 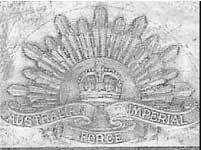 He signed up for the Australian Imperial Force at Blackboy Hill, Perth, W.A., which was a large training camp, on 29 June 1915. His Attestation Papers do not record his date of birth, but give his age as 24 years and 8 months; this confirms the census information and pinpoints his birth to October – November 1890. It also shows that his next of kin, his Mother, was now living at 27 Bletchley Road, Bletchley. Following a period of training, along with the rest of the 11th Battalion Reinforcements, he embarked on H.M.A.T. A38, ‘Ulysses’ at Fremantle, W.A. on 2 November 1915 and sailed to Egypt, where they joined up with what was left of the 11th Battalion, which had been evacuated from Gallipoli. On 29 March 1916 the battalion embarked on the ‘Corsican’ at Alexandria and sailed for France, arriving at Marseilles on 5 April 1916. In less than four months Francis was dead. The battalion’s first experience of the Western Front was in the Armentieres area and apart from a few trench raids, including being on the receiving end of a heavy German raid on 30 May, they saw little action prior to the start of the battle of The Somme on 1 July 1916. Although the Australians missed the carnage of the first day of the battle, over the next month and a half, as the battle stuttered on, they suffered 23,000 casualties. Francis was one of these: he was reported as having gone missing in action on 25th July 1916 at Pozieres, as they tried to take the village. 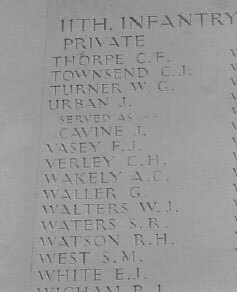 However, it was not until 20th June 1917, that a Court Of Enquiry officially declared that he had in fact been killed in action on that day. His body was not identified as being recovered and therefore he has no known grave. He is remembered on the Australian National Memorial at Villers-Bretonneux. The Villers-Bretonneux Memorial is the Australian National Memorial erected to commemorate all Australian soldiers who fought in France and Belgium during the First World War, to their dead, and especially to those of the dead who have no known grave. There are 10,700 Australian servicemen named on the memorial who died in the battlefields of the Somme, Arras, the German advance of 1918 and the Advance to Victory. The memorial stands in the grounds of the Villers-Bretonneux Military Cemetery (both were designed by Sir Edwin Lutyens), and was unveiled in July 1938 by King George VI. The cemetery itself was made after the Armistice when graves were brought in from other burial grounds in the area and from the battlefield clearance. There are now 2,141 Commonwealth servicemen of the First World War buried or commemorated in this cemetery and the graves of two New Zealand airmen of the Second World War. Of the First World War burials, 770 are Australian. The central tower is open to the public. Those brave enough to make the climb will be rewarded with magnificent views, north across the Somme Valley and west towards Amiens. Although the memorial and cemetery bear the name of Villers-Bretonneux, they are situated some two miles north of that village and are actually nearer to the village of Fouilloy.